Common Fish With the Letter "F"
Fairy Cichlid - Neolamprologus brichardi: This fish will entertain you with its interesting social interaction. They build a thriving colony that can grab your attention for hours with their antics. False Bumblebee Catfish - Leiocassis stenomus: The bumblebee catfish displays vibrant coloring. When it comes out of its hole to scavenge for food, it can be amusing, burying its head in a substrate to get a snack. Fathead Bichir - Polypterus weeksii: This fish gets its name from its large head. 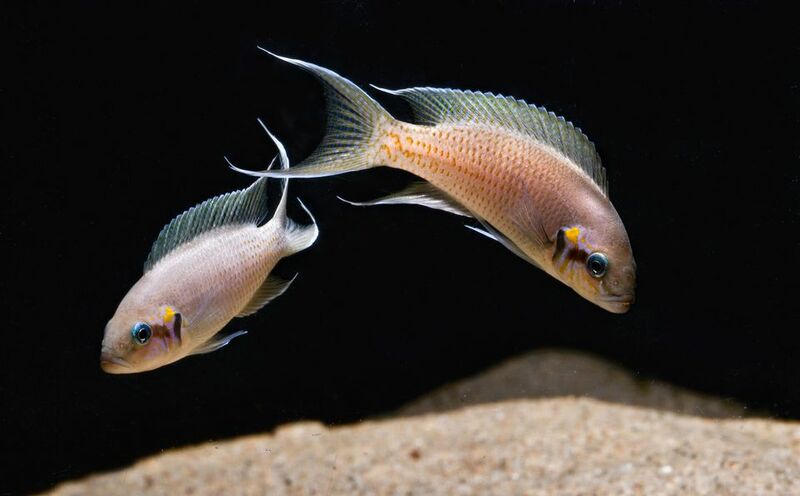 While it's relatively peaceful, it will eat smaller fish, so it should only be kept with larger, heartier tankmates. Feather-Barbel Catfish - Opsodoras stubelii: A barbel on a fish is a thin, sensory organ like a whisker near the mouth. It's used to find food and also contains the taste buds. Featherfin - Hemigrammus unilineatus: Native to the White Nile, Volta, and Niger Rivers as well as the Chad Basin, this fish is prized by hobbyists because of its high fin that looks like a feather. The fish makes a squeaking noise to communicate. Featherfin Synodontis - Synodontis eupterus: This fish likes a sandy bottom with crevices to hide and requires a tank of 50 gallons or more. Festivum - Mesonauta festivus: Festivum are very picky when it comes to choosing a mate. Once they do find a partner, they will be faithful to their mate for life. Fighting Loach - Nemacheilus notostigma: Clown Loaches will flick their tails at each other, engage in mouth-to-mouth combat which looks like kissing, and chase each other to establish dominance. Figure Eight Pufferfish - Tetraodon biocellatus: Puffers like to explore and like complex decor with an intricate layout along with lots of room to swim. If a puffer is pacing along the glass, he's likely bored! These are very personable and interactive fish, and they will grow to recognize you... especially when you have food! More Fish With the Letter "F"